Tell me what you think of an energy tax! A new bill that would result in you paying 30 cents or more per gallon of gasoline and home heating fuel has been proposed under the guise of carbon reduction. Referred to by some as a ‘Carbon Tax’, Senate Bill 6203 is actually an energy tax on families. It was given a hearing in Thursday’s meeting of the Senate Energy, Environment & Technology Committee and my colleague, Sen. Doug Ericksen, R-Ferndale, hit the nail on the head when he spoke out against it. Watch Sen. Ericksen’s passionate speech. The governor claims SB 6203 will lower carbon pollution in Washington state. However, as with carbon taxes in other states, it includes no significant reform of our laws related to carbon. Instead, it simply taxes the energy industry, which will drive the industry out of Washington State. Even more family-wage jobs will be driven out of our state. The companies will relocate to somewhere with fewer taxes and regulations where environmental regulations are minimal or non-existent. Families will be burdened with higher fuel prices, making commuting to their jobs and keeping their families warm more expensive. Rural families will suffer most since they often commute further, purchase gasoline for farm equipment, and don’t have access to urban power grids. Tell me if you support this tax on families. As you know, I am very passionate about telemedicine and how it can expand the access to care for rurual communities such as those in the 2nd Legislative District. But I also feel very strongly about how it can be applied to mental health care as well as standard medical care. The recent death of 21-year-old Washington State University quarterback Tyler Hilinski has propelled suicide among college students to the forefront of discussion in Washington. Although Tyler is not from my district, his death is still a tragic loss for Washington communities and should remind us that depression, anxiety and other mental health issues must be taken seriously, and support for those suffering must be expanded. According to an article in the Tacoma News Tribune, suicide is the second leading cause of death for men ages 18 to 45. The article sites a national college health assessment that found about 30 percent of college students felt so depressed the previous year that they had trouble managing life. It also cites a study that found 9.5 percent of students seriously considered suicide. 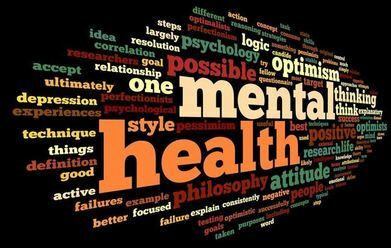 Mental illness is an epidemic in our society. 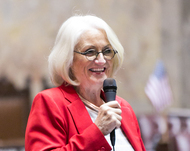 My colleague Rep. Paul Graves, R-Fall City, calls it an ‘Epidemic of Loneliness.’ It drives not only suicide, but also other forms of self-harm and a variety of mental disorders. These, in turn, can lead to homelessness, drug and alcohol addiction, crime and domestic abuse. Most families have been touched by mental health issues in one way or another. I, myself, have had a family member take his own life. The field of telemedicine includes telepsychiatry, which allows those suffering from mental health problems to seek professional care in a manner and location in which they feel comfortable — including in their own home. The expansion of telemedicine into this field allows doctors to help more people. One phone call or web chat could keep someone from doing the unthinkable. If you know someone who might be struggling, share with them the following information. And I promise to continue my efforts to expand telemedicine so that we can make our loved ones well. 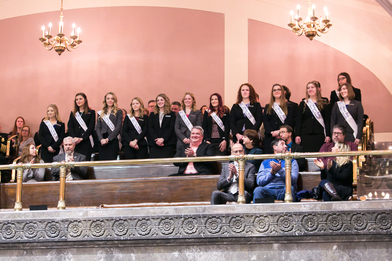 I was so pleased to welcome the Dairy Princesses to the Senate today for a resolution honoring the Washington State Dairy Council! These young women represent a vital agricultural industry that ranks as the second highest dollar-valued agricultural commodity produced in Washington, with a direct economic impact valued at almost $2.5 billion and a total value to Washington’s economy of more than $5 billion. The dairy industry here in Washington is older than the state itself. The first creamery in Washington was started in Cheney in 1880. There are over 6,184 on-farm dairy jobs in 29 counties across Washington and over 12,159 jobs in the dairy industry in total. Listen to my floor speech. Did you know that you can watch the Senate’s activities on the Senate floor, our press conferences, committee hearings and other legislative proceedings on TVW? You can watch coverage live and can also stream it on your computer or mobile device. TVW also keeps this footage in an online archive so, if you missed the speeches on an issue you care about, you can go back and watch the debate. 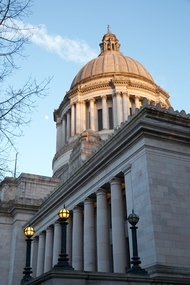 The Washington State Capitol Campus is a Pacific Northwest jewel and I am lucky to call it my workplace. I encourage you to visit the campus and my office. I would love to hear your perspective and meet you in person.